A make-ahead showstopper that’s so-simple to prepare and perfect for holiday bowl game snacking. Let the cheesecake stand at room temperature for about 15 minutes for easy spreading. Preheat oven to 325⁰. Line a 6-inch springform pan with parchment paper and lightly grease with cooking spray; place on a baking sheet. Combine cracker crumbs and butter; press firmly into bottom of pan. Bake 8 minutes. Remove from oven and set aside. Beat cream cheese on medium speed with a mixer until fluffy. Blend in milk and next five ingredients, mixing on low speed. Fold in Parmesan cheese and rosemary; spoon over crust and spread to pan edges. Bake 45-50 minutes or until center is just set when jiggled. Remove from oven and gently run a paring knife between the cheesecake and pan. Cool 1 hour. Cover and refrigerate 4 hours. Place cheesecake on a serving plate. 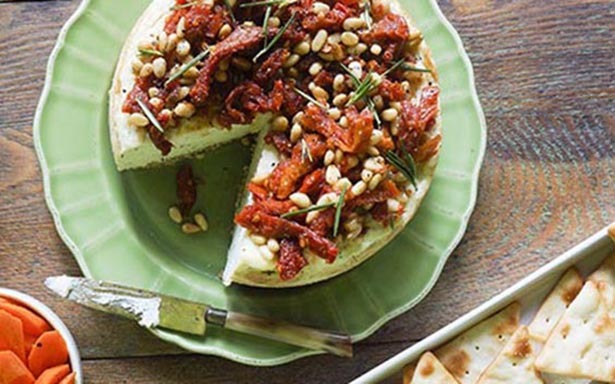 Toss together sun-dried tomatoes and pine nuts in a small bowl. Spoon mixture over cheesecake and garnish with fresh rosemary. Serve with crackers and crudité.